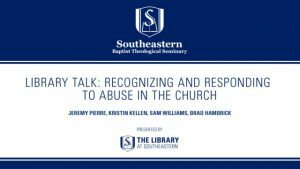 Sam Williams, Fulp Professor of Biblical Counseling Chair, discusses the topic of Recognizing and Responding to Abuse in the Church with a panel consisting of Brad Hambrick, Jeremy Pierre, and Kristin Kellen. Kristin Kellen and Brad Hambrick are both professors of Biblical Counseling at SEBTS and Jeremy Pierre is the Chair of the Department of Biblical Counseling and Family Ministry at Southern Baptist Theological Seminary. 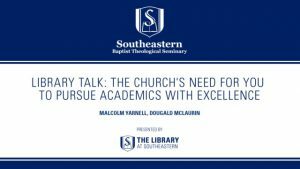 In this Library Talk, Dougald McLaurin will talk with Dr. Malcolm Yarnell about the church’s need for you to pursue academics with excellence while in school. 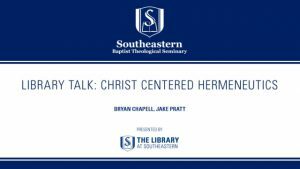 Dr. Yarnell is Research Professor of Systematic Theology at Southwestern Baptist Theological Seminary. He has published several books on Christian doctrine, the Trinity, and the Reformation. 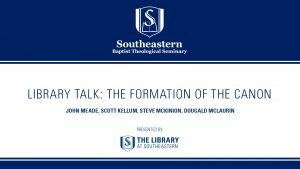 Dr. John Meade, Associate Professor of Old Testament at Phoenix Seminary, Dr. Scott Kellum, Professor of New Testament and Greek at Southeastern Seminary, Dr. Steve McKinion, Associate Professor of Theology and Patristic Studies at Southeastern Seminary, and Dougald McLaurin, Reference Coordinator at The Library at Southeastern Seminary discuss the early church, their canon lists, and the formation of the Christian canon during this Library Talk. 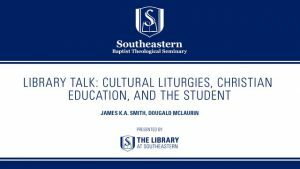 Dr. James K. A. Smith discusses Cultural Liturgies, Christian Education, and the Student. Dr. Smith will expound on his view of Christian Education and discuss how students can grow in a formative educational environment. Dr. Seth Postell, Dr. Tracy McKenzie, and Dougald McLaurin discuss the finer points of Compositional Theology and the legacy of Dr. John Sailhamer. All three panelists were students of Dr. Sailhamer and have been impacted by his teaching and life. 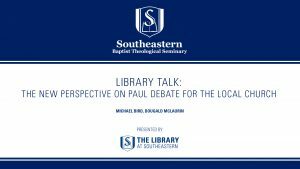 Michael Bird, a lecturer in Theology and Czar of Postgradistan at Ridley College in Melbourne, and Dougald McLaurin, Reference Coordinator at the Library at Southeastern, discuss the New Perspective on Paul Debate for the local church as part of the Library Talk. 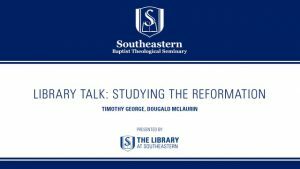 Timothy George, Dean of Beeson Divinity School, and Dougald Mclaurin, Reference Coordinator of the Library at Southeastern, discuss how we should study the Reformation, along with a look at the study habits of the Reformers as part of the Library Talk.